What Is the Difference Between Fairway Woods and Rescue Clubs? Learning the differences between various types of clubs is important for new golfers. Each category of clubs -- such as drivers, fairway woods, rescue clubs, irons, wedges and putters -- has its own capabilities. Understanding these categories helps you decide which clubs to carry in your bag and which individual club to select for a specific shot during a round of golf. The golf club category known as “woods” features large clubheads that used to be made from actual wood not too long ago, but are now made from metal. Technically, the driver is a wood -- the 1-wood -- although, you’ll probably never hear it called anything but a driver. The remaining woods are called fairway woods. Apart from the driver, the fairway woods are, as a group, the longest clubs, at about 41 to 43.5 inches. Common fairway woods include the 3-wood, which has 13 to 17 degrees of loft; the 5-wood, which is lofted at about 17.5 to 19 degrees; and the 7-wood, which contains about 21 to 24 degrees of loft. Rescue clubs are known by several names, including utility clubs and, most commonly, hybrids. The club combines characteristics of woods and irons, hence the name “hybrid.” The clubhead resembles a smaller version of a wood. But hybrids are typically shorter than fairway woods and contain more loft. The most common hybrids are labeled 3 through 7, with the numbers corresponding to the irons they’re designed to replace; although you’ll also find some 1- and 2-hybrids. As with all club categories, hybrids become shorter and more lofted as the club number increases. Club lengths range from about 36.5 to 42 inches, while the lofts range from 15 to 32 degrees. Despite the name, you can tee off with a fairway wood. In his book “How I Play Golf,” Tiger Woods recommends using a fairway wood from light rough, rather than a long iron. Off the tee, hit fairway woods basically the same as a driver. Just tee the ball up a bit lower because the fairway wood is more lofted. On the fairway, set up with the ball about 3 inches inside your front heel. Take a wide stance -- but not as wide as your driver stance -- and begin the backswing by taking the club back in a wide arc, low to the ground. Replicate this position on the downswing, so the clubhead sweeps the ball off the turf, rather than taking a divot. The rescue club’s label is also a bit of a misnomer because it does more than rescue you from bad lies. In deeper rough, however, a hybrid can rescue you because its clubhead will cut through thicker grass better than a fairway wood. 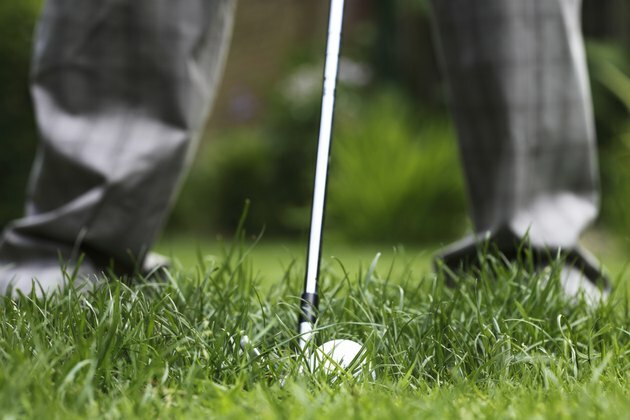 Swing the hybrid as you would an iron, hitting down on the ball and taking a divot in front of the ball’s position. You can also chip the ball with a hybrid if you’re close to the green, particularly if there’s a small obstruction in front of the ball. Just use a standard putting stroke and trust the hybrid’s loft to pop the ball in the air, over the obstruction and onto the green. What Is the Difference in the Dots on Ping Irons? Are Fairway Woods Necessary for Beginners?